In lurching through the world of fashion one is visited with the vague fatigue of brand hysteria, and to be mildly distrustful of it. Of course not, Suzy; it’s a brittle illusion that Hubert de Givenchy made the dress pictured above. In research for our July 1 post on the exhibit, PVB dug up le petit récit of the black dress worn by Audrey Hepburn. In fact, Hubert de Givenchy did design a LBD for the opening shot, but the dress was deemed too risqué – it showed too much leg. The dress was used neither in the film nor as a model for the celebrated film poster. 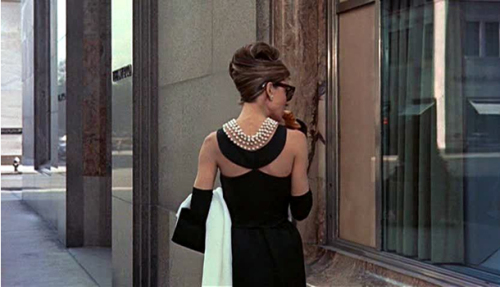 Fact: The LBD worn by Audrey Hepburn was created and made by Edith Head. Grand merci Edith. Note: The “Little Black Dress exhibition is organized by the Savannah College of Art & Design Museum of Art, and curated by Vogue Contributing Editor and Savannah College of Art & Design (SCAD) Trustee André Leon Talley. Its runs until Sept 22. This entry was posted in Reportage and tagged Fashion, New York Times, Paris. Bookmark the permalink.